This week's challenge is to organize coupons you've got stashed all over your home, in your purse, and waiting to be clipped. Although I am going to give some practical guidance in the ins and outs of coupon organization below, honestly there are many ways to organize these little slips of paper. In fact, not only are there lots of methods but there are some die-hard advocates of each method who swear it's the best and only workable system. The truth is that many organizational system will work, but which method will work best for you really depends on your goals for couponing, and your personality. 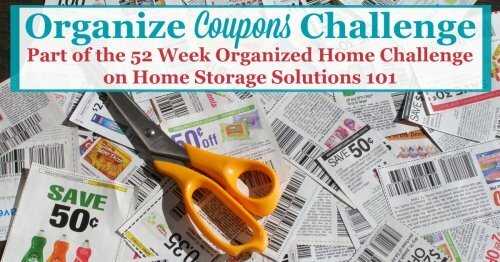 Therefore, this challenge also helps you think about these issues, so you can choose a manageable system for organizing and maintaining coupons that you can stick with. After all, what good are coupons if you can't find them and use them before they expire? Are you new here? 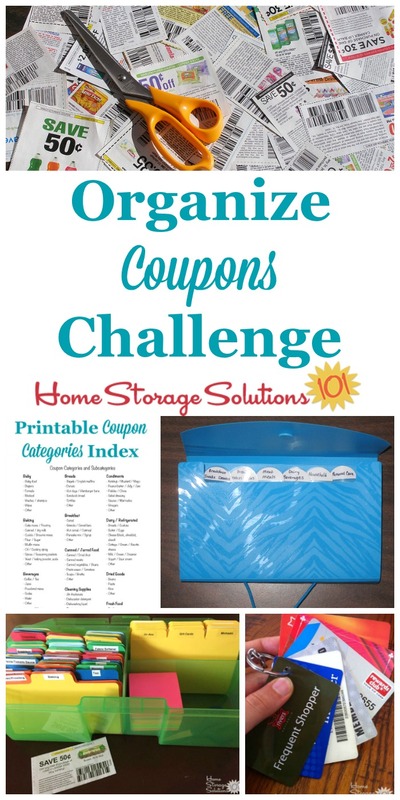 The Organize Coupons Challenge is part of the 52 Weeks To An Organized Home Challenge. (Click the link to learn how to join us for free for future and past challenges if you aren't already a regular reader). People vary in the degree of intensity in which they coupon, and your job in step 1 of this Challenge is to honestly figure out what kind of couponer you are from the extreme, to the sparing. For example, I think we've all seen at least a few minutes of the TV show "Extreme Couponing" by now, right? Well, these ladies (and a couple of guys too) spend a lot of time couponing, from finding deals, matching coupons and sales, and organizing those coupons. That's fine, but you don't have to spend that much time if you don't actually want to use a lot of these slips of paper. To a certain extent when you use coupons you're exchanging time for money. That's because it takes time to find the right coupon at the right time, and use it to save some cash. The goal of any organization system is to reduce the amount of time it takes you to find your coupons, thereby maximizing your money savings and time savings. However, certain organizing systems will quickly make work for you that will just waste your time, since they're too complex for the way you actually use coupons. A good rule of thumb is that the fewer coupons you actually use, the simpler your system should be for organizing them. Don't spend more time on this Challenge than it's worth to you. You should always see your time spent on organizing coupons as an investment, and never spend more time on it than you're getting in return in savings. Now that you've got the basic mindset down to best benefit you, please remember that couponing is not the only strategy for saving money on household essentials and food. For example, meal planning, which we'll discuss more in next week's challenge, can be a big money saver. 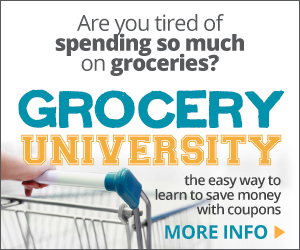 In addition, when you compare grocery prices with a grocery price book you can save money just by getting things when they're at their rock bottom low sales price, even without coupons. 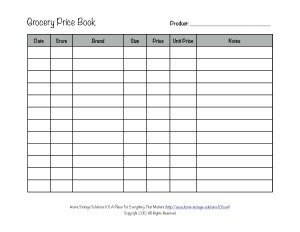 Therefore, I've created a free printable grocery price list you can use to help you track this information (see links above). Step 3: Decision Time - To Clip Or Not To Clip? The first two steps in this Challenge were pretty easy, but step 3 is where you've got to make a big decision. You've got to decide if, for your coupon organizing method, you will clip coupons, or you won't. What I'm referring to here is whether you'll take the time, up front, to cut out all the coupons and file them in some organization system, or you'll not clip any coupon until you plan to actually use it, and instead will just file the coupon inserts. At first this step seems like a no-brainer. Clearly, you may think, it would be easiest to not clip any coupons unless you'll actually need them, and to just file the inserts and be done. Many people swear by this method of coupon organization, and call it the "no-clip system" or similar words to that effect. They've used it successfully for years, and you may like it too. On the other hand, there are many coupon gurus who dislike this method, and will tell you in no uncertain terms not to do it this way, but instead to clip everything up front. With such differing opinions it can be confusing which method to choose, so I'll discuss some of the pros and cons of the coupon insert filing method below, so you can decide what's right for you. Honestly, I think it has more to do with your goals for couponing and your personality which way you like to organize coupons, and that's why there's so much disagreement of whether to clip coupons, or not. 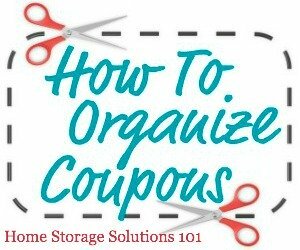 If you choose to organize your coupons with the no clip method it's pretty simple to do. You merely file the insert by date received (or issued), and then use a coupon database (see more in Step 4 below) to help you know what deals will work with those coupons, and pull them when needed. Once you've chosen to clip, or not clip, only part of the work is done. Now you've got to finish the details of choosing a method to organize coupons that works for you, and set up your system. 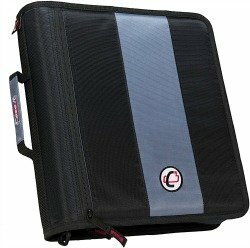 Your system must be portable, because it is important to be able to take it into stores with you. It is inevitable that you'll discover unadvertised sales, or otherwise wish you'd brought a coupon with you for use that you left at home if you don't bring in the entire coupon organizer. Put your name, address and phone number in your coupon organizing system. Since you're going to carry this thing around with you into stores there is a chance you may lose it, by leaving it in the shopping cart for example. Many strangers or store managers will be kind and return it to you, if you've put your contact information in it. Remember, no decision you make in this Challenge is set in stone. If you find your organizational method doesn't work well for you, for whatever reason, or you decide to either step up or step back your couponing efforts, you can easily switch to a new method to organize coupons. Keep experimenting until you find what works best for you. As I mentioned above, if you've decided to file inserts you really need to use a coupon database to help you match deals to coupons, and alert you to what coupons should be used in what weeks. This will help you know which coupons to pull, since you can easily forget what's in there without assistance. Frankly, even if you clip your coupons these companies which help you match coupons and sales can be a big help and time saver for you, so you may want to look into one. If you decide to clip coupons, no matter which option you choose below, they both require you to categorize your coupons. The reason is that once you clip all those little pieces of paper you're just left with big stacks that you can't find anything easily. I've created a list of coupon categories you can reference, with both main categories and subcategories, to help you get an idea of how you should categorize your own coupon collection. In addition, I've created a two page printable version of the categories and subcategories you can use as a table of contents in your binder, for example, if you choose that method. 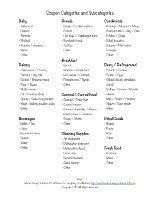 I've given a little more instruction on categories in the coupon categories article itself, so be sure to read it and familiarize yourself with the suggested categories when setting up your organizational system as part of this Challenge. Here's where I lay out the two main organizational methods for clipped coupons, so you can choose which one will work best for you. They are the coupon binder ad the coupon box or wallet. Many people use a coupon binder to organize coupons. 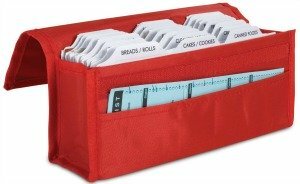 To make one, create tabs for each of your main coupon categories (see above) and dividers for your subcategories (if needed), and place them in a large, sturdy three ring binder. Place the coupons in special divider plastic sleeves, such as for baseball cards, or those shown below designed for coupons. Then, carry your binder with you on all your shopping trips and flip to the right page to retrieve coupons as needed. The other option for organizing clipped coupons is to place them in a coupon wallet or coupon box. Basically, all of these types of coupon organizer systems are portable filing cabinets for your coupons where, instead of retrieving coupons by flipping pages in a binder you thumb through the tabs and fing the coupons where you filed them. Here's one of the best explanations of how to organize coupons using a coupon box or wallet I've found. I've embedded the video of Carrie Isaac's explanation below because sometimes "seeing" how someone does it makes a lot more sense than me explaining it in writing. Although Carrie uses a box for her organizational system, unless you do a lot of couponing a simpler wallet will most likely work for you, if you choose this method. To the right is a small expandable file coupon wallet, which is perfect for someone who does not clip many coupons, and therefore does not need to have lots of categories. It is small and light weight, so it is easily portable and not too unwieldy. You've got to regularly add new coupons and cull old expired coupons from your organizational system, or it will quickly become useless and outdated. Therefore, the fifth step in the Organize Coupons Challenge is to get in the habit of adding new coupons to your organizational system about once a week. In addition, since many coupons expire at the end of the month get in the habit around the beginning of the month of combing through your coupons to remove all the expired ones. Remember, you can do these steps while watching TV or listening to music, or if your kids are old enough you can enlist their help in these tasks and make couponing a family affair! In addition, coupons generally follow cycles, similar to sales cycles, so even if you didn't get a chance to use a particular coupon before it expired don't feel bad (or make a special trip just to use it). Instead, be patient and a similar coupon will most likely come back around again. If you've got a lot of gift cards you can take a couple minutes this week and organize these as well. The advantages of this include not forgetting that you even have them to spend, not losing them, and using the entire balance off of them instead of letting money get basically wasted. I've written an article on how to organize gift cards that can give you some simple tried and true ideas. If you're a couponer then you've begun to amass a stockpile of supplies, either food and/or non-food items that you've gotten a great deal on, known as a stockpile. But these items are only helpful if you can actually find what you need when you want to pull something from your stockpile, it is still fresh, not expired when you want to use it, and it takes up an appropriate amount of space in your home and is not instead clutter. 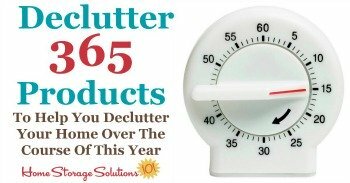 First, you should declutter excess from your stockpile, such as all the items you don't actually have room for, can't use within a reasonable period, or that have gotten too old or expired to use. You can read the linked Declutter 365 mission for more tips. Next, once you've gotten rid of the excess you should organize what you've got left. I've written an article with my best stockpile organization and storage tips, along with lots of reader photos showing practical real life ways they've organized their own stockpiles. Take time this week to get your own stockpile in order so your couponing efforts don't go to waste. I would love to know how this week's Organize Coupons Challenge is going. You can tell me your progress or give me more ideas for how you've organized this area of your life below in the comments. I also love before and after pictures of your couponing systems, and explanations of what you've done to make it work for you and your family. You can either share what you've done over the course of the week, or if you've already got a system that works for you, you can show me that as well. Submit your pictures (up to four per submission) and get featured in the Hall of Fame. You've worked hard to get organized, so now here's your chance to show off! I've received several great ideas and pictures from participants in the challenge sharing how they go about organizing coupons. You can see the hall of fame for this challenge here. Check it out for yourself to get some inspiration! We're working on our homes slowly, one area at a time, so don't get too distracted from this week's challenge. However, I know people like to plan for what's next, so I'll give you a little sneak peek. We're finally getting close to done with kitchen organization, since we've been working on various aspects of it from Week 1 through now. We'll finish out the process of organizing areas or functions of our kitchens next week when we focus on healthy meal planning and grocery shopping. Much of the organizing work you've done in previous challenges has culminated to make this task easier than you may have otherwise thought possible. I can't wait to get this section of our houses organized completely, can you?